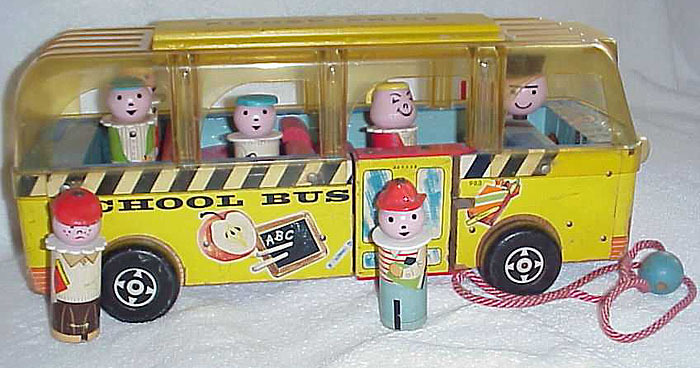 Description: The #983 Safety School Bus is the very first Original Little People set ever made by Fisher-Price. Prior to this set, Fisher-Price had made several pull toys with permanently attached figures, such as the #175 Gold Star Stagecoach with an attached driver figure and #200 Winky-Blinky Fire Truck with 2 firemen attached to the back. 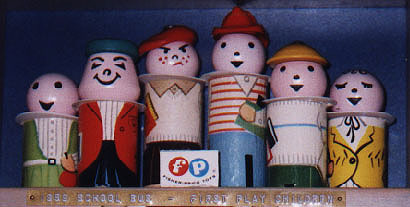 In 1959 and the first half of 1960 the bus was sold with only 4 removable figures. 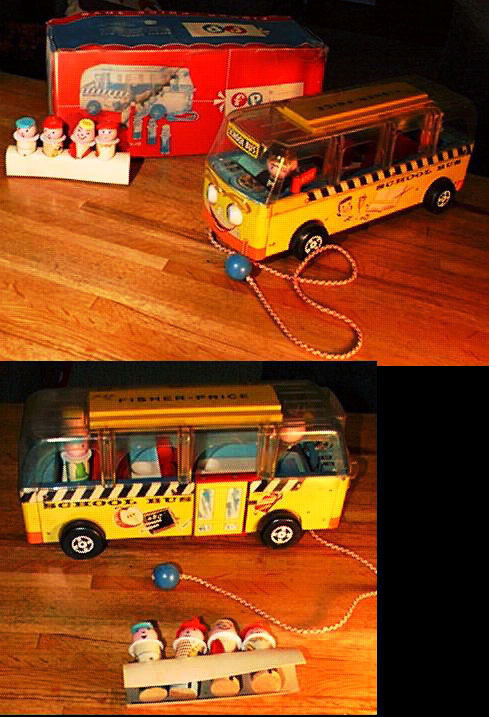 The 2 figures in the back seat were permanently attached and their heads would spin as the bus rolled. 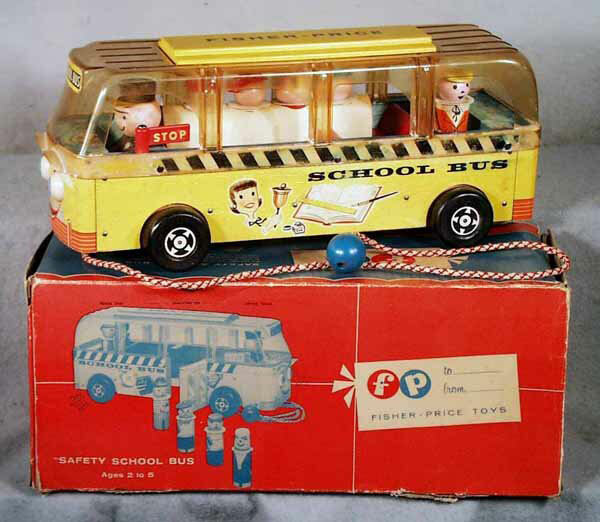 The success of the bus in 1959 led Fisher-Price to realize that children like playing with the removable figures. In 1960 Fisher-Price introduced two more pulltoy vehicles with removable figures - the #234 Nifty Station Wagon with a mom, dad, baby, and dog, and the #168 Snorky Fire Engine with 4 firemen and a dog. 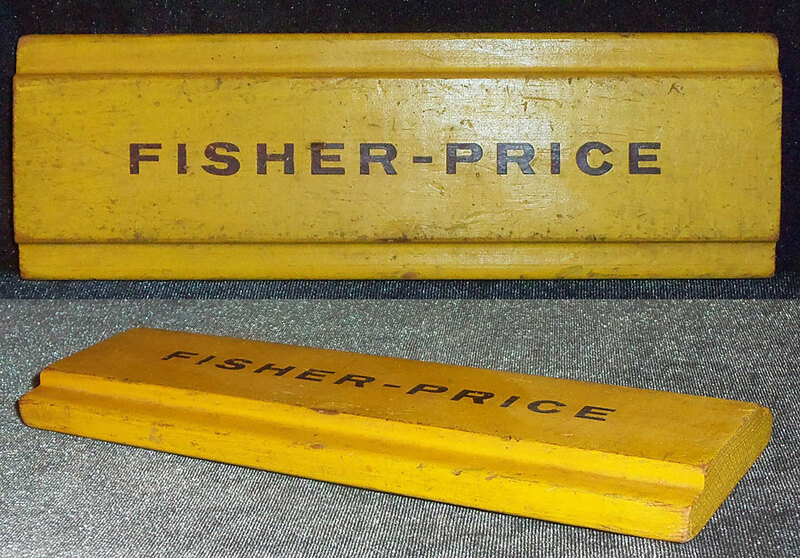 In addition, the later half of 1960, Fisher-Price modified the Safety School Bus by making the 2 back seat figures removable. The #983 Safety School Bus stayed in production until Easter of 1961, and was replaced with a slightly different bus and figures in the #984 Safety School Bus. You'd think they would had changed the name of the bus to prevent confusion? A yellow school bus with removable Little People children stayed in production through all years of the Original Little People line (1959-1990), into the Chunky Little People line (1991-1996), and on to the Current Little People line (1997+). In 1999's celebration of the Little People 40th Anniversary, Fisher-Price introduced #72699 Little People School Bus. The new bus was designed with features from the #983 in mind, such as the bus eyes move up and down, the passengers bounce in their seat when the bus rolls, and bus door opens, and the stop sign flips in and out. FPT555 - Large yellow 4-seat wooden school bus with a clear plastic top and an open rectangular area in the roof where the FPT8430 roof piece fits. The bus has 2 permanently attached figures in the back seat that turn their heads to look around. FPT826 - Large yellow 6-seat wooden school bus with a clear plastic top and an open rectangular area in the roof where the FPT8430 roof piece fits. KGWW - Boy frowning, with red freckles, wearing a red wooden beret, a white plastic collar with scalloped edges around his neck, and a litho body with a white shirt, tan collar, yellow and red books under his arm, and a dark brownish black base (pants?). This figure is 1/2 inch shorter than the 1959 figure "A" above. *See Variations below. KAWW - Boy with a big smile and oriental-looking eyes. He wears a bluish-green hat with a small tastle on the back, a round white flat disc collar around his neck, and a litho body with a verticle striped shirt, red open jacket, books under his arm, and a black base (pants?). This figure is 1/2 inch shorter than the 1959 figure "B" above. KFWW - Boy with dot eyes, half-circle nose, and a triangular mouth, a red fireman helmet, a white disc collar around his neck, and a litho body with a red and white striped shirt, green and black books under his arm, and a blue base (pants?). This figure is 1/2 inch shorter than the 1959 figure "C" above. EWW - Boy with dot eyes, half-circle nose, and a triangular mouth, he wears a yellow wooden disc-shaped cap, a flat white disc collar around his neck, and a litho body with a white shirt with a thin blue horizontal line across the middle, black and red books under his arm, and a green base (pants?). This figure is 1/2 inch shorter than the 1959 figure "D" above. KHWW - Girl with a bald head, black dot eyes, and a crooked smile, she wears a white disc collar around her neck and has a litho body with a verticle striped shirt under a green blazer with a white belt in the middle. The arms have verticle stripes, and one hand holds an apple. KIWW - Girl with downward curved eyes with eyelashes, a half-circle nose, and a triangular mouth, brown heat-stamped hair with curls on the end, a white disc collar, and a litho body of a white shirt under a yellow vest with a thin black bow tie in the front. KWWW - The Easter 1960-Easter 1961 boy that wears a red beret has also been seen with dot eyes, a half circle nose, and a triangular mouth. Click here to see a page with all of the figured used in this set.